When H.G Wells published his science-fiction classic The War of the Worlds, we were seized by a global fascination with extra-terrestrial life. The age of the alien had begun. In All About Aliens, the truth about alien life is revealed. From the origins of the alien concept from ancient myth right up to our ongoing hunt for cosmic neighbours in the modern day, this book is full of information that will give alien enthusiasts or sceptics plenty to think about. Ever wondered what an alien would really look like? What is the truth behind crop circles and UFO sightings? Is it scientifically possible for other life to exist? 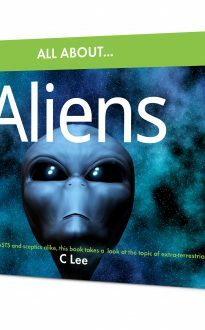 Answering these questions and many more, this book takes an honest look at our bug-eyed green friends and distinguishes the sense from the pseudoscience in this easy-to-read book on aliens. The ‘All About’ series tackles those intriguing topics we all love to think about. All About Aliens takes a close look into that most fascinating of question: are we really alone in the universe?